Multi-Touch applications in smartphones and tablet PCs have celebrated groundbreaking success in the last few years. With zenon you can now bring this revolutionary technology to Human Machine Interface (HMI) touch panels and to SCADA applications! Here, you can reach a new level in usability and security of machine and plant control. Reduced training time due to more intuitive handling and much more! 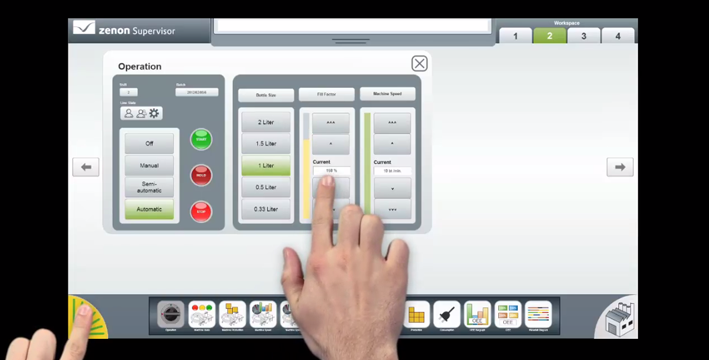 Multi-Touch allows the use of innovative operating concepts. For example, confusing menu structures can be replaced by freely configured scrollable toolbars (docks). To optimally serve each operator with relevantly defined information, it is possible to create individual process screens in Runtime, per drag & drop. Make reduced training time and fewer error rates possible due to more intuitive handling. Also less experienced operators can handle projects with optimum usability and operating safety. In addition, Multi-Touch offers features such as two hand operation. Here, specific actions can only be carried out by using two hands. This avoids unwanted actions from occurring and ensures both hands are on the touch panel during use.